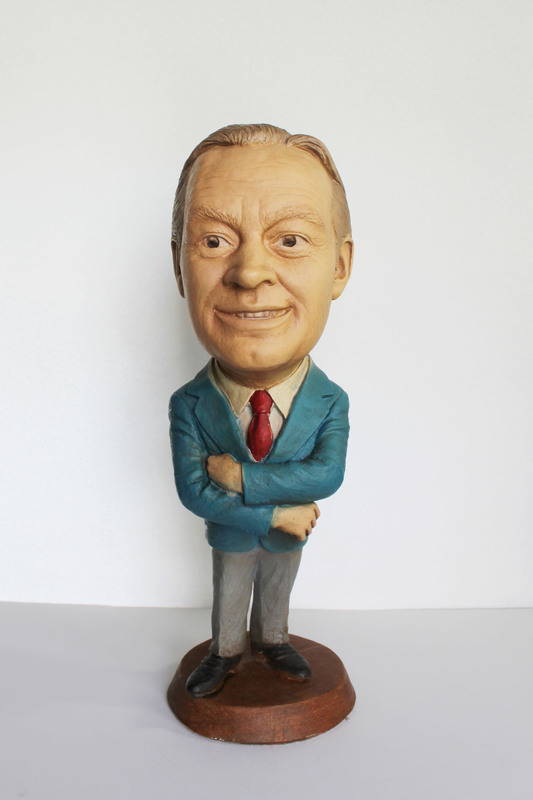 At the most recent auction sale I attended, no one wanted to bid on this 17″ statue from Esco Products in 1979. At first I thought it was Richard Nixon from my far away view. Then I heard them say, “Bob Hope Statue” so I decided to bid. I won. Do you remember the Bob Hope specials that were held every year on TV? I remember them mostly around Christmas time when he would visit the troops in a far away place. I loved the comedy of the live shows. I enjoyed the singing and the dancing, too. I also remember sitting on my Dad’s lap while watching. Maybe that is why I have such fond memories of those shows. I decided to put him up for auction on Ebay instead of listing him in my Etsy shop. He already has a bid, so he will be leaving here this weekend. However, the fun of the memories rushing back…priceless. Edited Oct 27: Mr. Hope sold for $63. For some reason I couldn’t get my link to work. This entry was posted in Junkin' Pickin' Finds and tagged Bob Hope by Karen Grosz. Bookmark the permalink. your ebay link doesn’t take you to the listing.